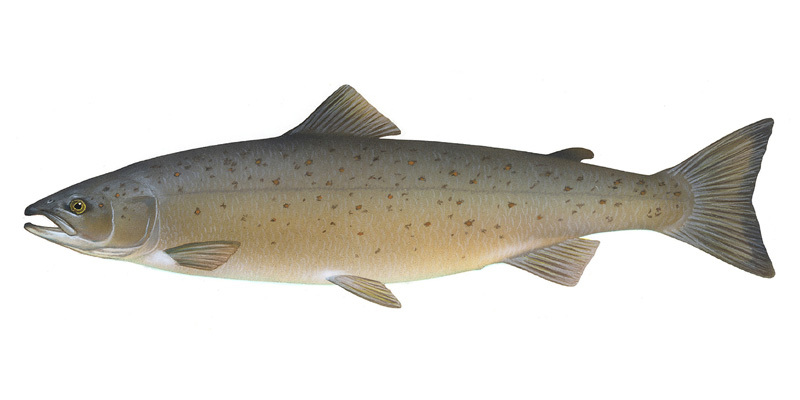 Atlantic salmon (Salmo salar); illustration by Timothy Knepp / USFWS National Digital Library (public domain image). Landlocked salmon are a subspecies of the Atlantic salmon but never migrate to the sea, living their entire lives in the freshwater lakes of the northern United States and Canada (Maine has 6,000 lakes and ponds). 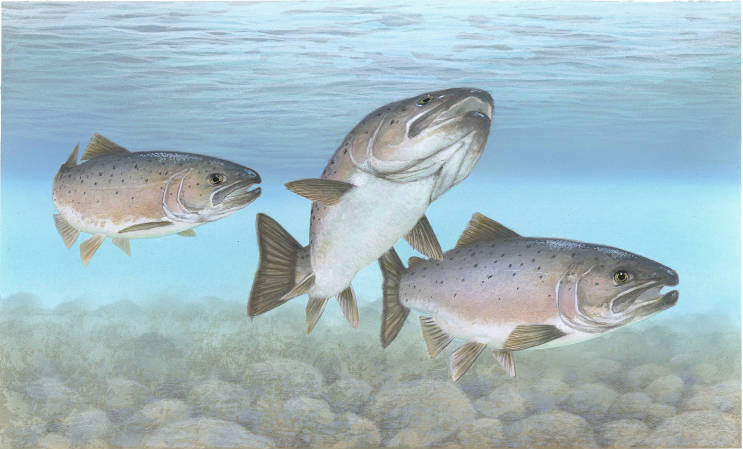 Atlantic salmon are born in freshwater rivers and spend their first 1 to 5 years there before migrating to the ocean where they grow rapidly for 1 to 4 years before returning to their birth-stream to spawn. Numerous species of landlocked salmon exist in the northern hemisphere - the two most prominent species in North America are the Sebago salmon (found in Maine, New Hampshire, and New Brunswick), and the ouananiche salmon (of Lac Saint-Jean, Canada). Landlocked salmon can weigh up to 35 pounds! Maine also recognizes two state "heritage fish" symbols: eastern brook trout (Salvelinus fontinalis) - adopted in 2005, and blueback charr (Salvelinus alpinus oquassa) - adopted in 2007. Atlantic salmon (Salmo salar); photo by Timothy Knepp / USFWS National Digital Library.